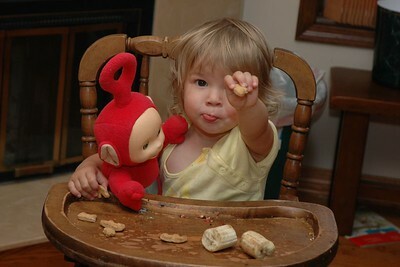 Alice is offering me the food because she had just tried to feed it to Po, but Po didn’t seem to be hungry. Charles has also become a bit more fond of stuff animals himself, but I think it’s just a reaction to Alice liking them, so they can fight over brown rabbits of various sorts. At a baseball game a few days ago, there was a large retriever in the stands. Alice was persuaded to pet the dog, which she was very reluctant to do. 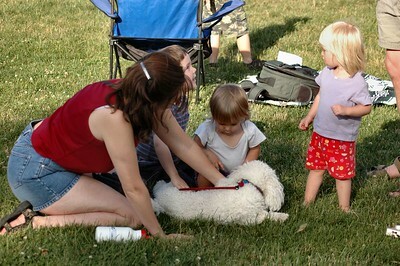 However, once she tried it she was hooked and spent much of her time at the game afterwards interacting with the dog. Alice frequently likes to pick up items and bring them to people and at the game she was picking up small rocks and bringing them to me (along with the coache’s 20 month old daughter Maggie). After discovering the joys of doggies, however, Alice tried to feed the small rocks to the retriever, who was remarkably gracious about it. 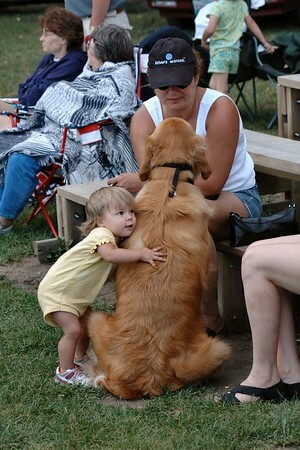 At the most recent baseball game, Jack’s parents and their dog Rufus were there. Rufus is a smaller dog than the retriever, not much bigger than Alice. Rufus is also an excitable dog who is normally starved for attention. But my sweet little Alice managed to wear out his tolerance for human interaction through shear persistence with maybe a few instances of stepping on Rufus. I had to haul her away so she could break down in racking sobs for 15 minutes because I wouldn’t let her play with one of the aluminum baseball bats. P.S. Poor Jack had his water sampled by Rufus and Alice while he was busy playing. There’s a one-two combo you don’t want to follow.